Understanding the voter resentment is also an opportunity for professionals. In his essay The Populism Perplex, Mr. Paul Krugman describes the sad reality that Secretary Clinton lost the POTUS election despite her winning over 2 Million of popular votes than the PEOTUS Donald Trump. Mr. Krugman describes this reality as a result of news media spending very little time on policy positions and explaining the fundamentals of the economics at work. He conveys his sense of disbelief while explaining the economy and job situation in Kentucky where the uninsured for health care are far fewer today. The jobs lost in the coal country are due to shifts in methods of mining (from underground to surface layers) as well as due to cheap natural gas through fracking. Clinton lost Kentucky heavily when she spoke of this reality and promised to replace the lost jobs through new jobs through renewable energy. Mr. Krugman concludes: To be honest, I don’t fully understand this resentment. In particular, I don’t know why imagined liberal disdain inspires so much more anger than the very real disdain of conservatives who see the poverty of places like eastern Kentucky as a sign of the personal and moral inadequacy of their residents. One thing is clear, however: Democrats have to figure out why the white working class just voted overwhelmingly against its own economic interests, not pretend that a bit more populism would solve the problem. We would like to offer a few thoughts to clarify the situation. Income can be through wages and non-wage income (through real estate appreciate and making money off money). This is 99 % Vs. 1%. Deriding this gap serves no one any benefit. This grip of the 1% on the 99% can be lessened only though higher taxation of the 1% for the benefit of the 99%. But sadly the country has elected one among the 1% as the next POTUS. This is like hiring a fox to guard the chicken coup. The 99% make their living through wage income. As we have described in the past, any wage can be earned only through one of three avenues: Professional Skill (ability to develop, deploy and implement a new solution – one could describe this as “Brain power”), Information work (to collect, process, analyze and disseminate information – one could call this as “Pen Power”) and Physical labor work (one could call this as “Muscle power”). Of these three today one can gain reliable income through Professional Work. Even this situation is precarious as the physical effort and information work content are being depleted routinely through relentless application of Digital Technology and its uses. The pen power and the muscle power have been diminished substantially as the sources of income through evolution in Digital Technology. This is well understood and well documented in many places. These jobs have literally fallen off the cliff. How did we get here? Any organization – place of work – is described as a pyramid. The bottom of any Organization Pyramid is made up of labor work force. Above them are the information workers and then the professional workers. In any organization we use a pyramid to depict that for good reasons. There were always more non-college educated labor workers. The number of college educated white collar information workers is fewer than physical labor workers. The number of professionals required are always far fewer than the other two categories. These work categories have been increasingly stratified since the advent of Digital Technology and its evolution since the late 1970s. But when these categories are clearly stratified and mobility across them is limited or eliminated (thanks to the standardized nature of work) now we have the highly divided and polarized America. Most of those with college degrees and professional work live on either coast (East of I – 95 and West of I – 5 corridors) and the rest – non college educated and mostly white, who have lost their jobs in information and labor work, live between these two highways. Indeed these are also the two polarized groups which have supported Secretary Clinton and Mr. Trump respectively. But this polarization and support for either candidate is not directly correlated to the level of employment as noted in the analysis reported in Fivethirtyeight.com. Instead it is far better correlated with the standardized or repetitive nature of nature of work. More routine and standardized the job, the voter support went for Mr. Trump. The majority of the voters with their work content that is least standardized or routine overwhelmingly went for Secretary Clinton. What does this voting pattern tell us? It seems to be directly linked to what we have described as the Binary Economy! Jobs or wage earning work at any level of skill can be standardized and hence de-skilled using Digital Technology tools. This de-skilling of work can be seen at any job and in any industrial activity and in any sector and in any region of the country. Such de-skilled jobs can also be automated and outsourced. What is left can command only low wages and often below the minimum wage. In these de-skilled jobs the power of the union is minimal as their contribution though skills that cannot be replaced is constantly reduced or eliminated. Industrial Midwest and much of the nation between the east and west coast has not found ways to replace these jobs with higher skill level jobs. There are few opportunities where the worker can integrate knowledge from many sources and hence offer higher skilled and higher value addition. This knowledge integration is not a matter of higher education alone. While higher education and college degrees help, that is not the minimum requirement. Instead an aptitude for discovery of a need, developing a solution and implementing the same and get paid for that is the new skill required. The startups culture and the entrepreneurship in the East and the West coast foster such on the job skill development. These are also the voters who see new opportunities in Globalization, alternative energy sources, solutions to counter global warming, etc. These are the voters who have overwhelmingly voted for the Democrats. The above skills development are not the Republican or Democratic priorities. Instead these are the priorities of those seeking high wage jobs and better incomes. But Democrats need to find ways to promote such skills development that supports and fosters the “Economy 1” in the Binary Economy model displayed in the figure above. This skill development cuts across all genders, races and economic levels. This new skill development has to be seen as the new Democratic priority. In this respect Senator Sanders’ call to Democrats to go beyond identity politics is correct. But his call that” understand that working-class incomes are down, and “stand up to Wall Street, to the insurance companies, to the drug companies, to the fossil fuel industry” may be dubious at best since these are obvious action steps without outlining the fundamental reason (i.e.) the relentless need for new skills development and investment policies that will draw on these skills with new job opportunities and solutions focused on that. Returning to Mr. Krugman’s comment: “To be honest, I don’t fully understand this resentment. In particular, I don’t know why imagined liberal disdain inspires so much more anger than the very real disdain of conservatives who see the poverty of places like eastern Kentucky as a sign of the personal and moral inadequacy of their residents. One thing is clear, however: Democrats have to figure out why the white working class just voted overwhelmingly against its own economic interests, not pretend that a bit more populism would solve the problem”. The resentment of the voters is not liberal disdain or affirmation of the conservatives. It is certainly against their economic self-interest. It is like the person sinking in the lake grabbing on to any straw no matter how flimsy it may be. Mr. Trump’s promise as an “outsider” to create new jobs and stop the bleeding of jobs from USA through trade agreements are the flimsy straws for the voters who see their demand for their skills – through muscle power and pen power – depleted. Either party that sees the real underlying causes – the polarization of jobs into few high skilled jobs (with decent wages) and large no. of low or no skill jobs (with constant spiral of diminishing wages) at all levels of the economic activity – and finds answers for that will be rewarded in the long run. In the meantime the elections will be just toss ups governed less by rational choices and more by emotions and irrational events such as hacking and Comey letters. As we have often said in our columns, the individual workers need not wait for politicians to figure out the evolving Binary Economy and the solutions for that. Instead they can seek out and learn skills for new solutions development. We call these new skills as the System Thinking and Transformational Skills. Posted on November 25, 2016 Categories Education, News, View PointsLeave a comment on Understanding the voter resentment is also an opportunity for professionals. What should you do when the thought leaders are so wrong? And so my question and this is really a serious worry; suppose one party becomes the party of less college and who feel head winds, and that would be the Republican Party, I think. And suppose another party becomes the party of the tail winds because they’ve got college degrees, and that would be the Democratic Party. Suppose our partisan realignment over laps with a class alignment and that to me is extremely problematic for what it says about what’s going to happen. His fellow panelist Tom Brokaw concurred with this prediction saying that it goes against all preconceived notions the media had about Republicans. And also this is a profound shift because the Republicans are representing those who don’t have a college education,” Brokaw explained, “We’ve all grown up with Republicans who are at the high end of the income scale and are the elitists in American life. So this has been turned upside down. Both David Brooks and Tom Brokaw are well respected national thought leaders. No one can question their wisdom, experience or acumen. Yet in their above comments one has to believe that they are merely expressing their opinions rather than reasoned factual conclusions (which we expect from these thought leaders). It is true that a large segment of the population feel the head winds. This is due to the massive standardization and de-skilling of work of any kind and in any sector. This includes manufacturing, accounting, medicine, not to speak of Walmart and McDonald work. This has nothing to do with college degrees. It has everything to do with aptitude, a willingness to put in hard work with our supervision and follow-the-herd mind set. For this skill and work, the salaries are rushing close to the minimum wages. So, even after two jobs in a day, one can not still take care of a family. In the above scenario college degrees are used today merely as a screening tool as evidence of diligence and ability to follow the rules. If you have these skills you don’t need a college degree. Large cross section of people who fall in this category are both Democrats and Republicans. Simply because Bernie Sanders and Hillary Clinton promote ideas on free or affordable college education, those who need such help are not merely Democrats. Since over 80% of what one needs to know as information (falsely attributed as knowledge) is already available through internet (Google, search engines and social media) the need today is not college education, but a job or solution that needs your services. The smart people are those who can find such opportunities and they can get attached to them. We call them as Transformational Skilled workers. Hillary Clinton has been promoting this kind of skill development through Community Colleges and Vocational Technical Schools. Those with a blend of academic education (not necessarily a four year college degree), attached to real world needs and opportunities, but with an unending zeal (Transformational) to identify, develop and deliver a stream of new solutions are the few with the tail winds at their back in the new Binary Economy. These few are not Democrats or Republicans. They are both. Unfortunately the current POTUS election is not a contest for identifying these head winds and tail winds. Instead it is a contest between a demagogue and opportunist (who has already benefited from the tail winds at the expense of many) and a life long Methodist (who believes in social good for as many as she can help). Also the tail winds favor a few at the expense of the many. This is seen as the rise of the 1% vs. the 99% who suffer the pains of the head winds. Protection for the many against the head winds may need social programs and Government involvement – which would be the Democrat’s preference. Instead people may be left to fend for themselves, while Government steps out of the way – which would be the Republican’s preference. 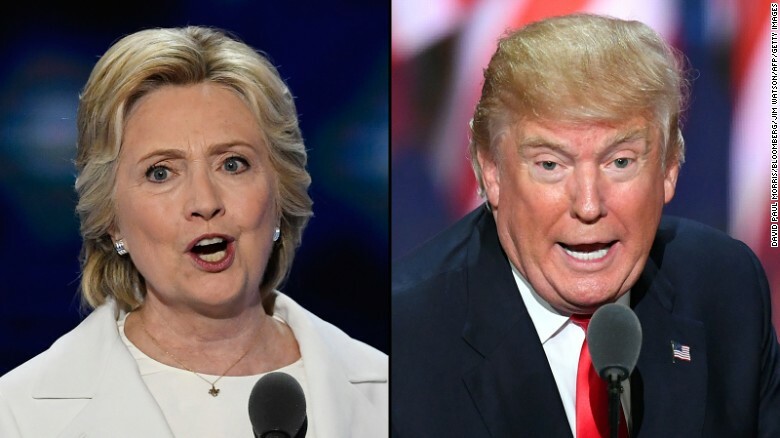 Unfortunately these are not the subjects of debate in the current election cycle, since one candidate (Hillary) has policy proposals, while the other candidate (Donald Trump) has nothing but lot of words with little in terms of policy alternatives. Tail winds can be taken advantage of by individuals to lift their own boats. This is the preference by Republicans (through their preference for tax cuts for the rich). Benefit of the tail winds can be used by sharing for larger common good (through tax increase for the rich). This is preferred by the Democrats. This may be the only policy difference one can see between the two parties. Some of those who benefit from the tail winds are clearly noted in the media. The many “Pundits” who offer constant opinions on news, TV and social media are not necessarily the highly educated – with reasoning and logic as their core values – but instead are those who have a drive and will to appear in as many media outlets as they possibly can and repeat or regurgitate what is already known over and over again. We can only hope that scholars and thought leaders like David Brooks, and Tom Brokaw will not fall into that category of media opportunists who express their opinions as facts. How to bring back the jobs that are “never coming back”? Here are a few thoughts for both the Republicans as well as Democrats. Independents have to be concerned about this as well. But our purpose of writing this blog is larger than the issue of individual coping skills in this emerging new economic order. For countries like India it will require economic policies that go beyond mere reliance on Manufacturing sector or “Make in India” as the sole growth engine for the future. The Western or developed economies and industrial developments have largely been based on a simple model: “The economic success of an individual is judged by how large (limitless) one can consume energy”! – The richer you are, you own and enjoy bigger house, bigger planes, more cars, boats, ….” These are also countries with small population size. Their emphasis on manufacturing are also related to products and services that support such energy intensive needs. Today developing nations – India, China, …- seem to be copying the same models (with more reliance on cars, planes, highways, airports, ….). In fact copying this energy intensive opulence can be seen when the rich conduct their family weddings on board the airplanes! Investments in support of the above model benefits a very small fraction of the population – as one can expect – at the expense of the unmet needs for the larger population in the developing nations as well as the developed nations. One can see the writing on the wall ! Then what is the way out? In a “Global Economy” the problems of any one has to be come the problems of all. USA as a world leader has to assume responsibilities for the global problems: World wide need for food, shelter, drinking water, energy efficiency, ecology, etc. Attempts to solve these problems of all also provide plenty of opportunities for high wage jobs and employment for highly skilled professionals. Invest in areas to (a) educate and (b) employ a large number of skilled professionals, who are also educated and trained on System Thinking with Transformational Skills. Start thinking of “Technology” not limited to IT. This is not the the current or prevailing notion. Start thinking of all Physical Technologies as means to solve a wide variety of problems and meet a broad range of needs of the global population. This would be like investing through NASA, NIH, Transportation, Space, etc. but many times over! These programs must be targeted not only for the immediate needs of the nation, but for the larger needs of the globe as a whole: Drinking water, food, home and shelter, better climate, low cost energy, better use of natural resources, better use of the ocean and the outer space, renewable energy, etc. Pollution in China need not be a crisis for China alone! Lack of adequate food distribution and hence hunger need not be India’s problem alone! Global leadership requires ownership of global needs! Where does the money for this come from? The unbridled use across the globe of developments inside of USA based on Physical Technology has given rise to unlimited wealth for investors who exploit the use of such developments across the globe, enabled by IT applications and their capabilities. These are the “new riches” of Globalization today that go with out being taxed. GOP and the conservatives do not wish to tax the hard earned income of individuals. We agree with that. But the “new riches” – the non-wage income generated by investors – can not fall in the same category of income as that of the wage earners and their reward for their hard work. Investment for new high skill jobs that has to come from the federal government, since federal jobs can be protected and preserved to remain within the shores. Like the peace core that created good-will across the globe, we need Professional Core of high wage workers that can work in the USA and create a stream of new solutions based on a wide variety of technologies (beyond IT) for the betterment of the human kind across the globe as well as for a better planet tomorrow. To this end Non-Wage income earners can contribute through higher taxes and the government can target this additional income for creating such high wage jobs. The workers in these high wage jobs through their system thinking and Transformational skills have to be truly mindful of the outcome of their work and not become government employed bureaucrats merely pushing papers and administering programs, as they are perceived to be in the current work force. Posted on July 30, 2016 July 30, 2016 Categories Education, News, View PointsTags Bringing back the jobsLeave a comment on How to bring back the jobs that are “never coming back”?